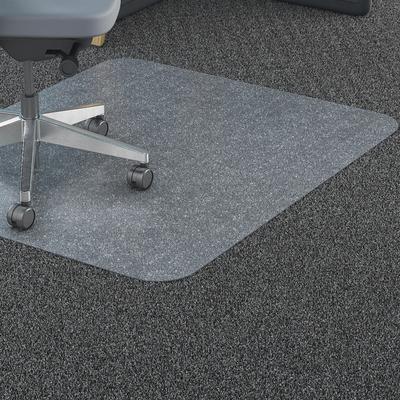 Designed For Convenience And Perfect For Big And Tall Applications, This Resilient Chairmat With No Lip Can Be Used For Low-Pile Carpets. Durable Surface Protects Floors From Chair Scuffs And Caster Damage. Its Exceptional Clarity Lets The Beauty Of The Floor Show Through While Its Easy-Glide Rolling Surface Provides Effortless Chair Mobility. Rectangular Polycarbonate Chairmat Features A Straight Edge And Is Studded For A Strong Grip Without Piercing Or Damaging Your Carpet Backing. More From The Manufacturer.